Giving and receiving an Easter basket is a timeless tradition that brings family and friends together. 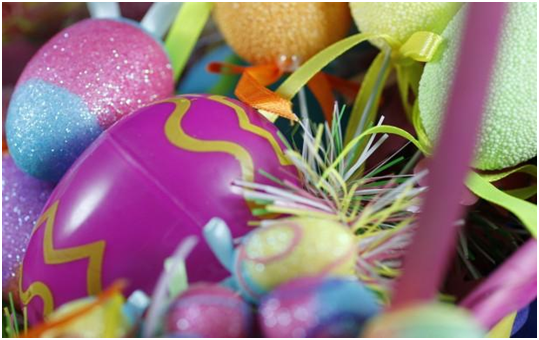 Easter baskets also make wonderfully festive springtime decorations for your home. Instead of just filling a basket with a few random treats and goodies, why not make this year’s baskets extra special? After all, making springtime memories are what Easter is all about. Here are five ideas to get you started, but don’t be afraid to branch out and make them your own! This basket is great gift for the kids who no longer live at home. Young adults don’t always have extra money to spare, and sometimes the little things that were taken for granted at home just don’t fit in the budget. Fill a basket with simple household products like nail clippers, socks, lotion, toothpaste, deodorant, and any other necessities they might need. They might not be the most exciting gifts, but money saved is money in the pocket. Of course, it never hurts to include a few fun treats and trinkets in there to balance things out. Who says you have to give your homemade Easter basket away? Setting up a beautiful decorative basket at home is fun, and you can enjoy it year after year. First, go basket hunting. Go to thrift stores, local decorative shops, and online stores, and seek out the perfect basket. Next, get inspired! You could take the traditional route and fill it with real or artificial hay and some dyed eggs, or you could fill the basket with soil and plant daffodils, tulips, irises, or other spring blooms. There are endless options, and you can always change the contents, so don’t be afraid to think outside the box…or basket. Combining two favorite uses for baskets, we have the combination Easter/picnic basket. For this one, you may want to seek out a basket with a closing top so that it can be transported, but you don’t have to. 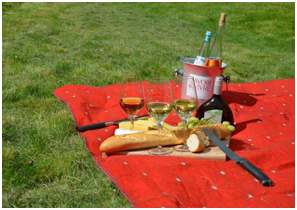 Next, simply fill the basket with classic picnic treats like cheeses, dried meats, olives, candies, and other finger foods, as well as a bottle or two of wine for the adults. If you don’t plan on going picnicking immediately, make sure you only include non-perishable food. Throw in some silverware, plates, and a blanket, and you have the ultimate Easter picnic basket! Instead of filling this year’s Easter basket with a bunch of small, inexpensive gifts, why not use that money to get that special person something a little nicer? While Easter gifts are not typically elaborate, there is nothing wrong with a surprise. Instead of filling a large basket with candies and trinkets, fill a small basket with one or two gifts that you know the receiver will really appreciate. To ensure a proper fit, Paper Mart recommends purchasing your gifts before you pick out the basket. This Easter basket idea is perfect for the younger kids, and it gives the adults some time alone to fellowship. We recommend starting this game right after Easter brunch or dinner (can you say naptime?) but of course that is up to you. First, hide a variety of gifts throughout the house or outside. At each location, write down a clue on a piece of paper, and place it in a plastic egg. 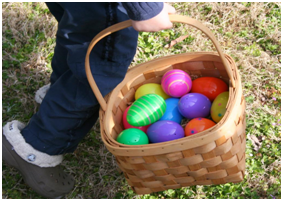 Make sure you keep track of the eggs/clues so they go to the right children. Now just give them their baskets full of clues, and let the games begin! Author Bio: Lynn Lewis is a freelance writer from Omaha, Nebraska. She has written for clients like Demand Media and the Omaha World-Herald. When she isn’t working on DIY projects with her two daughters, Lauryn and Lila, she’s volunteering at her local pet shelter.